Nike Basketball Camps now offers over seventy locations nationwide including Complete Skills sessions, Shooting Camps, Post/Perimeter Camps and more. US Sports Camps, Inc. is pleased to offer several new summer basketball camp locations for both boys and girls. More and more parents and athletes recognize the importance of developing skills in the summer, so they can make their teams in the winter. Nike Basketball Camps provide focused, intensive training that is essential to improvement for all skill levels. Every facet of the game is covered with an emphasis on fundamentals to help players become valuable team members. At each location, campers are broken into groups with other players of similar age, abilities and goals. Each camp staff does their best to advance players to the next level, keeping in consideration each camper’s experience and desire to improve. The 2012 schedule features camps from coast to coast with overnight and day camp offerings. The Nike Basketball Camp lineup is headlined by new day camp locations at Neumann Goretti High School in Philadelphia, PA (Boys) and Arlington Country Day School in Jacksonville, FL (Boys) and new overnight locations at Elmhurst College in Elmhurst, IL (Girls) and University of Mary Washington in Fredericksburg, VA (Girls). Since our inception in 1996, we have hosted over 42,000 campers at our basketball camps. Last summer alone, over 5,000 young athletes got better at a Nike Basketball Camp – you can also take your game to the next level this year. Nike Basketball Camps are operated by US Sports Camps (USSC), headquartered in San Rafael, California. USSC is America's largest sports camp network and the licensed operator of NIKE Sports Camps. The company has offered summer camps since 1975 with the same mission that defines it today: to shape a lifelong enjoyment of athletics through high quality sports education and skill enhancement. 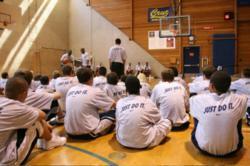 Players, Coaches, Parents and others interested in the 2012 Nike Basketball Camps can visit http://www.ussportscamps.com/basketball/nike or call 1-800-645-3226.